In LibX 2.0, all code that runs in pages (for autolinking, etc.) is based on LibApps. You can see the LibApps running in your edition by selecting the “LibApps” tab in the Preferences. It is possible to create your own LibApps via the LibApp Builder. The LibApp builder is a web interface, similar to the edition builder, that allows anyone to create modules, libapps, and packages. It uses a separate sign up than the edition builder, so you have to create a separate account. To build your own Libapps, you’ll need to learn about packages, libapps, modules, and feeds. The best and most comprehensive documentation we have is Sony Vijay’s MS thesis. Sony is the primary author of the Libapp Builder. The LibApp that links ISBNs can be found here. It is really just a description of the modules it contains, for instance, this one. This LibApp is part of a package, which is found here. The LibApp builder allows you to create, share, modify, and publish package, LibApps, and modules, without needing to understand the internal (XML) format you find in the links above. What, then, are feeds? Feeds are a vehicle to serve packages, LibApps, and modules. Each of them is stored inside a feed, based on the AtomPub specification. That’s why we refer to them collectively as ‘entries’ (see atom:entry). A feed may contain multiple entries. But note that a package or LibApp may be composed of entries from multiple, different feeds. So for instance, you can create a new LibApp in a new feed you create, but it can refer to (and thus use) modules contained in other feeds (such as the LibX core feed, which we maintain). To use the LibApp builder, you thus need to create a feed, and at least one package, one LibApp inside the package, and then you can add modules to it. It also includes a search interface so you can include modules others have created. For more information, read Sony’s thesis. LibApps can be tested right from the LibApp builder. If you have LibX installed, it’ll tell LibX to temporarily download your LibApp code and run it. Once you’re satisfied, you can “publish” it, which freezes it and puts it at its final location. If you’re an edition maintainer, you can subscribe your users to packages you trust. Since LibApps can do things that are potentially sensitive, we do not offer a search interface for LibApps and package that were created by just anyone (though anyone can create any LibApps), but rather only by users we trust. Nonetheless, as an edition maintainer, you can subscribe your users by specifying the URL of the package you want them to subscribe. Note that you need to specify the package URL, not the location of the feed. 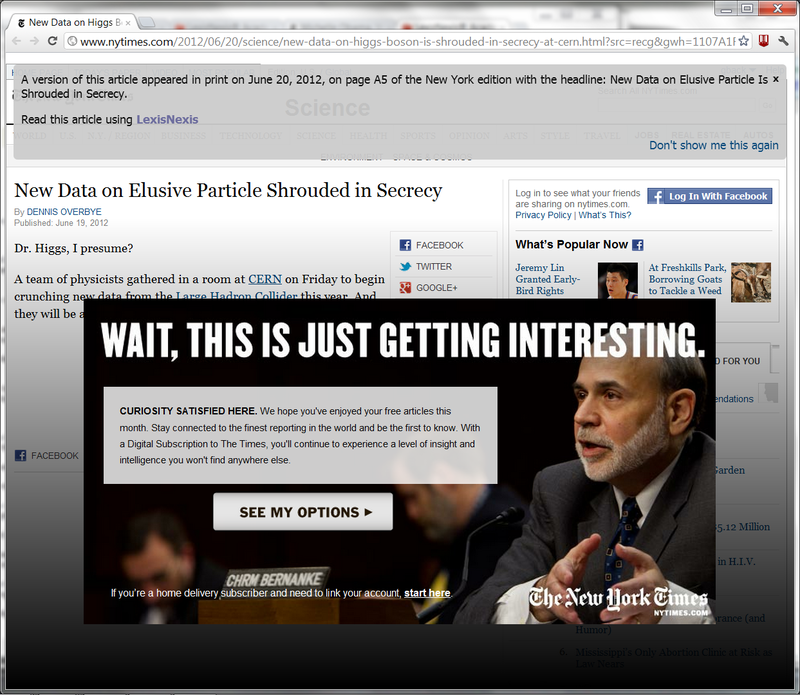 For instance, the LibX core feed is at libx.org/libx2/libapps/, but the LibX core feed is at http://libx.org/libx2/libapps/libxcore. We’d love for people to give it a try. In addition, if the user hovers over the link, a tooltip appears that displays additional information about the item to which the identifier refers. LibX uses services such as xISBN, xISSN, or CrossRef’s and Pubmed’s APIs to retrieve metadata about the item, such as the title, author, publication year, and others. LibX editions in which Summon is configured as the primary catalog will go even further: when the user hovers over the link, LibX will contact that library’s Summon instance to search for the item in Summon. The results of this search are directly displayed in the tooltip, as shown below. To contact Summon, LibX has two options, which we call “Summon Widget” and “Summon API (via proxy)”. The Summon Widget service is less detailed and does not show circulation information, but can be used immediately by any Summon customer. The Summon API (via proxy) requires an API key and it requires that you run our proxy on your machines where the API key is located, but it provides more detailed information. The Summon API also requires that the URL of the Summon proxy be included in the edition configuration. Please note that the enhanced autolinking feature is available only if Summon is configured as an edition’s primary (i.e., first) catalog. (Otherwise, the autolink would lead to a different location than what appears in the tooltip, misleading the user). The enhanced autolinking feature was developed by Anand Swaminathan (anand12100@gmail.com). Below are screenshots for autolinks around ISBN, ISSN, DOIs, and Pubmed Ids found on different pages. Note that for ISBNs, LibX searches Summon for all editions listed by the xISBN service, not just the one hyperlinked. The screenshots show the results when the Summon Widget service is used. We are now introducing the edition recommendation system to LibX to make it even easier to find the correct edition for your university. Whenever you visit the LibX home page, a list of editions will be automatically generated based on your IP address that are linked to your university. You can click a link to load the LibX edition inside the page, and from there you can install it with the install button. 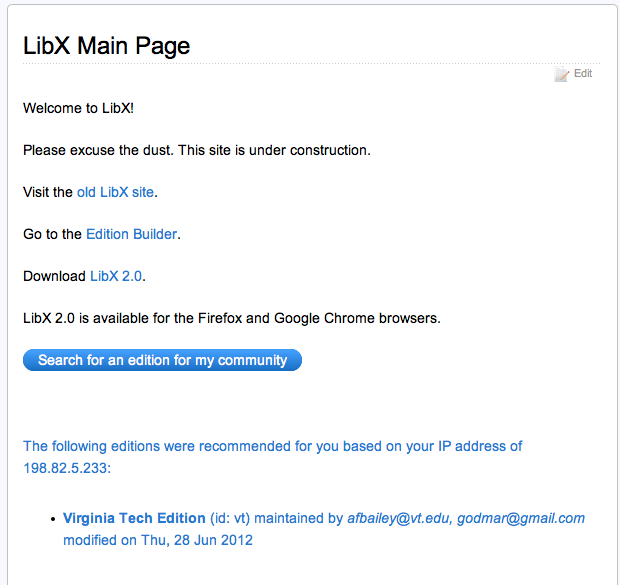 The libx.org home page with the edition recommendations (in this case, just Virginia Tech) shown. This system is also present inside the LibX plugin. Clicking on the “change edition” link inside the plugin shows the recommended editions in addition to the standard search box. Again, this works based on your IP address. The LibX plugin showing the same recommendation list. A key goal of LibX 2.0 is to integrate with services such as Summon, which provides an API. Whereas LibX 1.5 mostly provided links a user could click on to initiate a search, LibX 2.0 aims to provide the resulting information directly to the user. If your institution subscribes to Summon, your edition can make use of these services as well. As pointed out above, nothing needs to be done if you’re content with using the Summon Widget API, except you must make sure that Summon appears in the first position in the list of catalogs. If you wish to use the more detailed Summon API (via proxy), you are required to install a proxy service that LibX can contact to search Summon via the API. Unfortunately, such a proxy is necessary because accessing Summon via the API requires a key, and this key must be hosted securely on a server belonging to your institution. Fortunately, it is very easy to set up. All you need is an Apache server that can run PhP scripts, and you’re good to go. All you need to do is to drop the PhP scripts provided into some directory, add the key. Full instructions are on this page. Then, you’ll have to tell LibX where to find the service. This is also described there. If you have ideas where to include Summon results, let us know!